Drawing inspiration from the past with a design for today's traveler, the recently refurbished Hilton Paris Opera is impressive. With 268 stylish guestrooms, three beverage and dining locations, a bar, flexible meeting and event facilities, and professional services, there is more than enough to see to any guest’s needs. 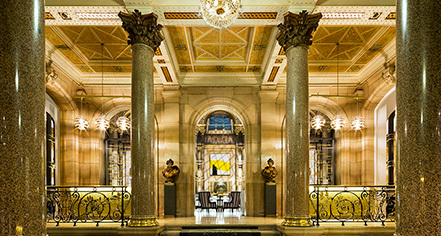 Situated in a prime location in the city center, this iconic hotel has been the portal to Paris for more than 125 years. Being in the center of Paris, there is no shortage of iconic sites within easy distance of the Hilton Paris Opera. The Louvre Museum, which holds the Mona Lisa and other famous works of art, and the Champs Elysées, which is one of the most recognizable and fashionable avenues in the world, are just a couple of the nearby cultural sites. For fashion-oriented guests, the nearby Le Printemps and Galeries Lafayette department stores provide a French sophistication with a mix of international brands, and business guests will benefit from the proximity to the La Défense business district. 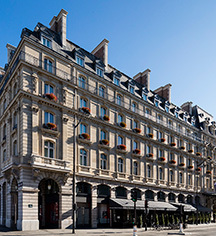 Hilton Paris Opera, a member of Historic Hotels Worldwide since 2018, dates back to 1889. The Head Waiter of this historic hotel assisted in the state dinner hosted at the Louvre Palace for Queen Elizabeth in 1957. Parking: Off-site parking is available at a surcharge. Pet Policy: Service animals allowed, pets not allowed. Rollaways: $70.00 EUR per night. Transportation: Limo and town car service is available; restrictions apply. The landmark Hilton Paris Opera opened on May 7, 1889, during the World’s Fair in Paris. Initially named Hotel Terminus, it was built by architect Juste Lisch and designed to accommodate transatlantic travelers arriving from Normandy via the Saint-Lazare station. Learn more about the History of Hilton Paris Opera .